Usually, I try to share something fun going on in my life or something cute the kiddos are doing. But today, I'm just not feeling it. I think the kiddos (and the adults) are having a few issues adjusting to life after the holidays. Maybe it's the terrible twos settling in a little early in the twins. Yep, the favorite word around here is, "no!" Maybe Lil Bit just needs a little more sleep than she's getting as we adjust to getting up before 6. I just want to be warm again. Yes, I know North Carolina isn't known for cold weather...and a lot of you are experiencing real cold. But there's a reason why this girl likes living in the south, and trust me, it isn't the grits. I hate being cold all the time. My husband: How he spent two of his days off last week helping my parents around their house...unprompted by anyone. Lil Bit: How she's super excited about all the crafts and coloring books she received for Christmas! Between her crafts and her creating "restapees," I figure I only need to work on this blog for a couple more years before I can hand the reins over to her. Sweet Pea: How she loves to snuggle with her mama. Enough said. I'm going to be sad when she outgrows my lap. Princess Pea: How she is trying out new words all the time. And how all three of my girls want to read a book..all the time! There. I feel better. 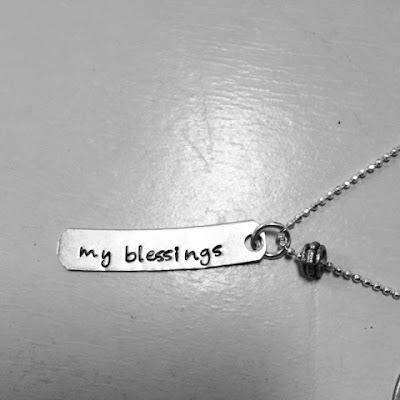 I guess counting the blessings in my life...is a blessing in itself. Sweet :) It's easy in the hustle and bustle of day-to-day life to forget those little bright spots. Glad you stopped to see them! I feel like the post holiday funk has set in around here, too. This post made me smile, though. :) Thank you! Stopping by from SITS. We are definitely in a funk. But, as excited as I was for my kids to go back to school, I missed them (a little bit!) I was however very glad to have one on one time with my Tiny today! Awe, this is a great way to improve your mood, love it. And confession time, I'm 30 and still love to sit on my moms lap, when she lets me! I must say I prefer the extra holiday time off before Christmas rather than after Christmas... there's so much more to do in December. We're in a funk too, just waiting for school to get back.